Airplane window photography is one of the great bonuses of travel. You already have to get there, and if you can capture a few shots along the way, all the better. "Pennsylvania Bridge" - Captured with an iPhone X through the plane window and processed in Luminar 2018. Photo by Derrick Story. Just like I think that Luminar 2018 is the perfect app for drone photography, I think it's just as powerful and amazing for airplane window work. For this image, captured with my iPhone X and automatically imported into my Photos for macOS app, I used the Luminar Editing Extension that's bundled free with the app. It's easy to use. Just click on the 3 dots at the top of the editing tools and choose Luminar 2018. Sending the original image to Luminar 2018 from Photos for macOS. 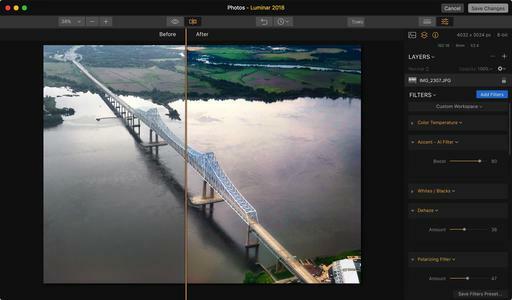 I then choose the Aerial Photography Workspace in Luminar. It's a great starting point for the edits. I decided to add a couple additional Filters (Vignette and Image Radiance), then clicked the Save Changes Button to return to Photos. As you can see by the Before/After illustration below, there is a dramatic improvement to the image. The Before and After in the Luminar Editing Extension. The workflow could not be simpler. The iPhone image was automatically uploaded to my Mac via iCloud. It was waiting for me in Photos. The Luminar Editing Extension is ready to use. I spend a minute or two improving the shot. Then the saved changes are automatically shared to all of my devices, including back to my iPhone. Airplane Window Photography has never been easier, or more beautiful.